For nearly 13 years, Disney’s Aladdin – A Musical Spectacular has presented the magical tale of Aladdin in a lavish, immersive production at the Hyperion Theater in Disney California Adventure Park. The dynamic stage show became an instant hit with guests and the cast has performed it more than 14,000 times. Now, guests are invited to experience the “Wonderful! Magnificent! Glorious!” musical – with words such as those from the Genie and other memorable characters – before the final, flying carpet ride on January 10, 2016. An exciting, new stage presentation of Frozen will open at Hyperion Theater in the summer of 2016. 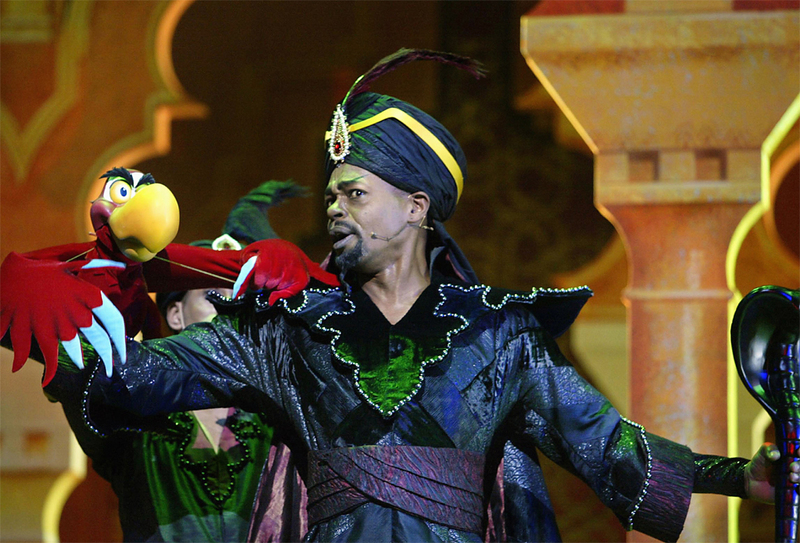 Since its premiere on Jan. 16, 2003, Disney’s Aladdin has entertained more than 13 million visitors. Based on the popular Disney animated film, Aladdin, with music by Alan Menken and lyrics by Howard Ashman, and Tim Rice, the theme park show is filled with music, comedy, dancing and fantastic special effects — plus countless timely quips by the show’s magical Genie. Disney’s Aladdin – A Musical Spectacular performs several times a day and now has Disney FastPass service, to reserve a show time. The schedule is available in the park’s show times guide. Puppets for the show, including the original Iago, Elephant, horse and snake puppets, were created by Michael Curry Designs, the same team that designed the Tick Tock the Croc seen in Fantasmic! and the Sebastian puppet in Mickey and the Magical Map. The song To Be Free was written by Alan Menken, specially for the musical stage show at Disney California Adventure. Opening-day makeup artist Brad Hardin continues to prep performers for the daily shows. As he introduces himself to Aladdin, Genie shows off his powers with bright lights, magical tricks and an extravagant musical number, Friend Like Me, featuring energetic and acrobatic clones of himself. Aladdin and Jasmine discover A Whole New World as they soar above guests’ heads aboard a flying Magic Carpet, passing by breathtaking monuments around the world. 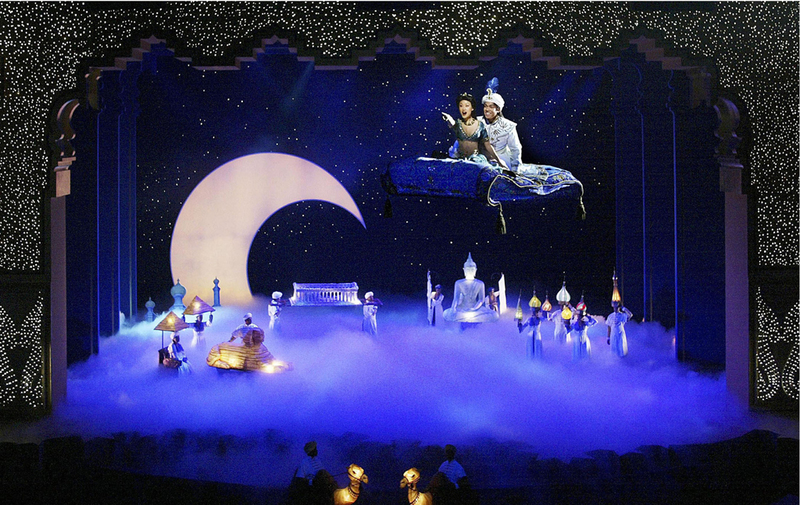 Under the guise of Prince Ali, Aladdin makes a grand entrance into the Hyperion Theater by riding an “elephant” through the seating area, followed by a trail of dancers carrying priceless treasures and animals. 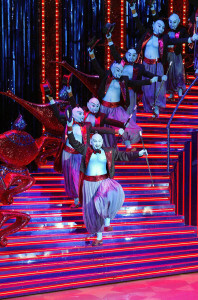 Genie’s jokes frequently change to reference popular culture and current events, making each performance a unique experience. This entry was posted in Home Page, Home Page Slider, News and tagged Disney California Adventure, Disneyland Resort, Disney’s Aladdin – A Musical Spectacular. Bookmark the permalink.